Tuesday, September 16, 1912: Just about the same things done over every day with just a little change here and a little more there. Both then and now– some days are just the same old, same old. Since Grandma didn’t have much to say a hundred years ago today, I’m going to share some interesting data that I found about the average salaries for selected occupations a hundred years ago and now. The 1912 data are from an article in the September, 1912 issue of Ladies Home Journal titled “How Other People Live.” The current data was from the Bureau of Labor Statistics. Of course all the salaries are much higher now than they were back then because of inflation. But it’s interesting to compare which salaries were relatively high and which were relatively low across the two years. I used the most recent data available from the Bureau of Labor Statistics for the 2012 data. 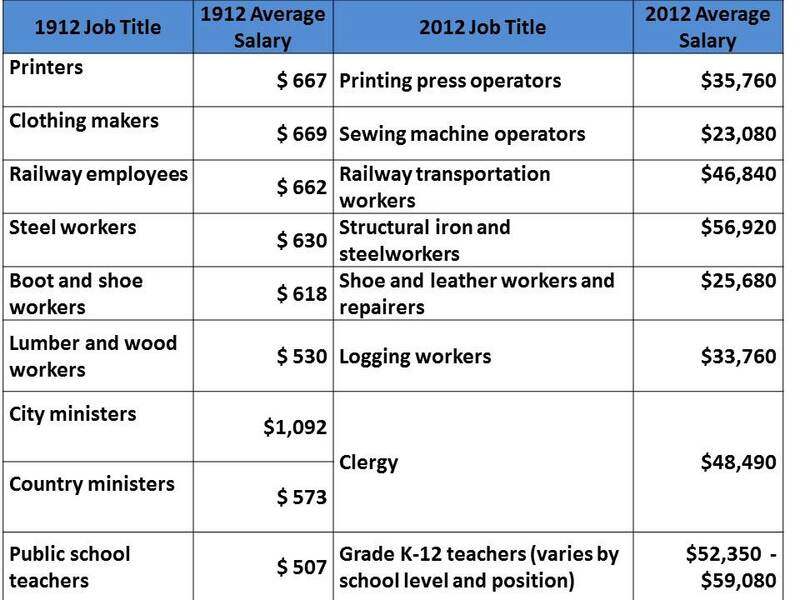 It actually was 2011 data, but I assumed that salaries haven’t changed much over the past year. Posted on September 17, 2012 September 17, 2012 by SherylPosted in StatisticsTagged 100 years ago, 1912, family history. $10 to $15 dollars a week was the norm for a man with a good job. You could buy a very nice home for $400. That was fun to think about. It serves as sort of a value and inflation gauge. I can’t help but think that the number of those positions available in this country has probably changed drastically in 100 years. There can’t be many clothing makers/sewing machine operators still working in the United States. And there must be many fewer railroad workers as well.